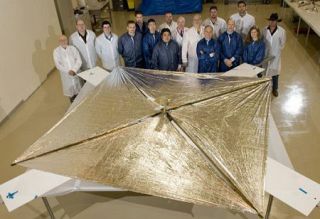 The Huntsville-based NanoSail-D team stands with the fully deployed sail at ManTech SRS technologies on April 16, 2008, after the successful deployment test. A small NASA satellite carrying afolded-up solar sailejected from its mothership in low-Earth orbit Monday (Dec. 6),marking akey success in NASA's efforts to develop and deploy solar-sailtechnology. NanoSail-D, which is about the sizeof a loaf of bread,ejected from NASA's washing-machine-sized FASTSAT satellite at 1:31a.m. EST(0631 GMT) Monday. "This is a great step for our solarsail team with thesuccessful ejection of the NanoSail-D satellite from FASTSAT," DeanAlhorn, NanoSail-D principal investigator and aerospace engineer atNASA'sMarshall Space Flight Center in Huntsville, Ala., said in a statement. Nanosatellites, also known as cubesats,are typically launched and deployed from a mechanism that mountsdirectly on alaunch vehicle. This is the first time NASA has mounted this mechanismon amicrosatellite to eject a cubesat, agency officials said. FASTSAT ? short for Fast, Affordable,Science and TechnologySatellite ? launchedNov. 19 from Kodiak Island, Alaska, bearing six differentscience andtechnology demonstration payloads, including NanoSail-D.
"The successful ejection ofNanoSail-D demonstrates theoperational capability of FASTSAT as a cost-effective independent meansofplacing cubesat payloads into orbit safely," said Mark Boudreaux,FASTSATproject manager at Marshall Space Flight Center. "With this first stepbehind us, we have demonstrated we can launch a number of differenttypes of payloads using this common deployment system from anautonomousmicrosatellite like FASTSAT." Upon ejection, NanoSail-D initiated athree-day countdown tosail deployment, which should therefore take place in the early morninghoursof Dec. 9. With its sail out, NanoSail-D shouldstay in low-Earth orbitfrom 70 to 120 days, according to NASA officials. Over time, thesatellite willuse the sail to de-orbit, spiraling lower and lower without usingcostlypropellants like traditional satellites do. The NanoSail-D flight results willhelp to mature thistechnology, perhaps enabling it to be used on future missions. Solarsailscould help de-orbit larger craft, thus helping free Earth orbit ofdangerous,cluttering space junk, NASA officials said. NanoSail-D is not the firstspacecraft to demonstratesolar-sail technology. In June, Japan's Ikarosprobe deployed its solar sail, becoming the first craft tocruise throughspace propelled only by sunlight.